This test system can evaluate the shearing strength of strong earthquake-resisting wall panels of wooden houses. In order to evaluate earthquake resistance of wooden houses, a pseudo dynamic test is one method to enable that without shaking the whole structure. 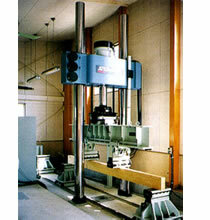 This test system can execute the bending test of full-sized materials and aggregate materials of beams, girders, etc. and the tension test of joints.